Background: Enamel demineralization resulting in White Spot Lesion (WSL) is one of the most common disease outcome associated with fixed orthodontic therapy with high prevalence rates in western countries. However, no such studies have been done on Indian population. Aim: The aim of this study was to evaluate the prevalence of WSLs in a section of urban Indian population between the age group of 12-20 years undergoing fixed orthodontic therapy for a period of 12-15 months. Materials and Methods: 180 patients who qualified for this study were examined and evaluated for WSLs: Group I (test group) comprised of 90 subjects who were undergoing orthodontic treatment for a period of 12-15 months; Group II (control group) comprised of 90 subjects who were in need of orthodontic treatment. Results: The result showed a high prevalence rate of 75.6% in Group I compared to 15.6% in Group II. Conclusions: The study elicited significantly higher prevalence rate of WSLs in Indian patients undergoing fixed orthodontic treatment. Reports of prevalence of WSL in population based in western countries have been published, ,,,,, but none pertaining specifically to Indian population. An electronic search was conducted in the PubMed database with appropriate MeSH headings and key words related to studies on the prevalence of WSLs in patients undergoing orthodontic treatment and study reports on Indian population. A hand search of indexed journals was also conducted to support the electronic search results. This process showed a negative result with relevance to studies done on prevalence of WSL in Indian population undergoing orthodontic treatment for a period of at least 12 months. Several studies on the prevalence of WSLs revealed a high prevalence rate of 50-96%. ,,,,,, These reports have been based on various visual examination techniques and are usually assessed at the completion of orthodontic treatment or experimental procedures subjecting teeth to in vitro demineralization and evaluation. In visual examination, by default, the validity of the scoring system and the efficiency of the clinician play a crucial role. The International Caries Detection and Assessment System (ICDAS) presents a new paradigm for the assessment of dental caries. This criterion for measurement of caries process was developed based on insights gained from a systematic review of reports on clinical caries detection systems. The ICDAS-II system was developed to bring forward the current understanding of the process of initiation and progression of dental caries which could be easily applied by our clinicians in day-to-day clinical practice. ICDAS is an easy chair side examination method requiring only an overhead operating light and an illuminator. To ensure the observers efficiency in scoring for ICDAS the observers have to undergo an online test for ICDAS-II scoring to become a validated ICDAS examiner. The aim of this study was to assess the prevalence of white spot lesions in a section of Indian population undergoing fixed orthodontic treatment for a time period of 12-15 months using a validated scoring system - ICDAS II. This study was a cross-sectional clinical study. The study involved patients who reported for orthodontic therapy in various orthodontic centres in the city of Chennai, India. [Figure 1]. 180 patients were considered for the study. Ethical clearance for this cross sectional study was obtained from the Research and Ethical Clearance Committee of the University. An informed consent explaining the study design and purpose was also obtained from every patient prior to their participation in the study. Group I (test group) comprised of 90 subjects who were undergoing active orthodontic treatment for a period of 12-15 months; Group II (control group) comprised of 90 subjects who were patients who had reported for need of orthodontic intervention but in whom the treatment had not yet commenced. In order to make the study sample representative of the general population, it was decided to make this a multi-centric study. The study design incorporated 50% of the samples of each group from an orthodontic department of a dental college, which primarily caters to patients from lower socio-economic group. The remaining 50% of the samples of each group were surveyed from exclusive private orthodontic practices, which were catering to patients from the higher socioeconomic strata of the general population. Subjects between the age groups of 12-20 years. Subjects with mild to moderate crowding and undergoing procedures for pre-orthodontic diagnostic evaluation. Subjects who were undergoing only pre-adjusted edgewise technique of orthodontic treatment with stainless steel brackets. Standard oral hygiene procedures are being followed: (flouridated toothpaste (1000 PPM) for brushing and 0.05% (acidulated phosphofluoride) oral rinses. Patients undergoing orthodontic treatment for less than 12 months. Patients on long term medication for systemic illness. 1 - Opacity or discolouration hardly visible on a wet surface, but distinctly visible after air drying. Enamel demineralization limited to the outer 50% of the enamel layer. 2 - Opacity or discolouration distinctly visible without air drying. No clinical cavitations detectable. Demineralization involving between 50% of the enamel and the outer third of dentin was visible. The examination protocol included a thorough oral prophylaxis for all subjects of the test and the control group. This was followed by a visual examination under direct illumination on a dental chair using a light reflector and a three-in-one syringe. The study design included clinical and visual examination of the labial surfaces of the maxillary and mandibular anterior teeth, labial surfaces of the premolars and the occlusal surfaces of the molars respectively for evaluation and scoring of White Spot Lesions. The test and control groups were then divided as subjects with single WSL, subjects with more than one WSL and subjects with no WSL at all. The statistical analysis was carried out using the SPSS software. A Pearson Chi-square was done initially which was followed by a t -test which involved the independent samples test. Group statistics were performed for both the study group and the control group. To evaluate the inter-observer reliability the scores of both the observers were subjected to a Kappa inter observer coefficient analysis. The results of this study [Figure 1] revealed that in the study group a cumulative percentage of 75.6% of subjects had WSLs, which implied that 7-8 out of every 10 patients undergoing fixed orthodontic treatment had a prevalence of at least one WSL. On the other hand, in the control group a cumulative percentage of 15.6% of the subjects, i.e., 1-2 out of 10 subjects had prevalence of WSLs. In the study group, 18.9% of subjects had no lesions at all and subjects with one lesion were a large proportion of 56.7%. The subjects with more than one lesion were a 24.4% cumulatively. The Chi square test results show that the prevalence of WSLs in the test group compared to the control group is highly significant statistically (P< 0.001). 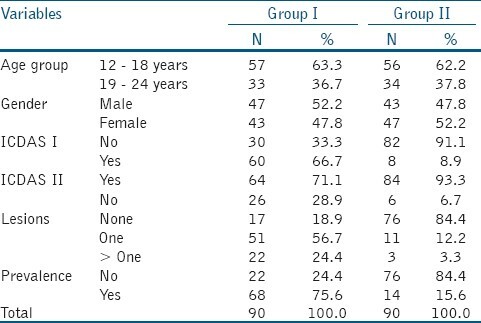 The independent T-test results showed that the mean age of the respondents in Group.1 is 17.8 ± 2.46 years, whereas it is 17.9 ± 2.23 years in Group.2. The Kappa coefficients for inter examiner agreement was 0.76 [Table 1],[Table 2] and [Table 3] [Figure 3]. Based on the pre-and-during orthodontic treatment examination, this study showed a high incidence of new WSL (75.6%) in patients treated with comprehensive orthodontics. Gorelick et al reported a prevalence of 50% whereas Boersma et al showed a prevalence of 97%. The results of this study indicate that WSLs remain a considerable problem during orthodontic treatment. This study is in concurrence with other reports based on western population, which show a high prevalence of WSL after orthodontic treatment. The inference of the study results clearly indicate that the age of the patient does not play a role in the prevalence of the WSLs. This is suggestive of the fact that the process of enamel demineralization is not dependent on the subject's age. When considering the gender bais on prevalence rate the statistically insignificant value (P=0.551) also rules out the role of gender biasing in the process of enamel demineralization. The Chi-square test results indicate a highly significant role of the fixed orthodontic appliance in the formation of WSLs, which suggests a directly proportionate relationship of the process of enamel demineralization and fixed appliance orthodontic therapy. Gorelick et al indicated the maxillary lateral incisor while Geiger et al showed that the maxillary lateral incisor and canines are the most common teeth affected. Bach reported prevalence of WSLs on first permanent molars, followed by maxillary central and lateral incisors, mandibular incisors, second molars and finally canines and premolars. The evolution of appliances resulted in the change in sites of occurrence from the posterior to anterior and from the interproximal surfaces to the vestibulo-gingival enamel areas. ,,, However, in this study there were more WSLs seen on maxillary incisors, followed by canines and then the maxillary and mandibular premolars. However, there was no predilection to any specific tooth for the occurrence of WSLs. Fluoride is an important tool in the prevention of dental caries. It has been shown that fluoride may reduce the number of WSLs developing during orthodontic treatment. Geiger et al found a 30% reduction in the number of patients and a 25% reduction in the incidence rate of WSLs, when orthodontic patients used a fluoride mouth rinse. The efficacy of the preventive measures such as mouth rinse or dentifrices is, however, dependent on patient compliance. The daily use of a 5000ppm fluoride gel along with a fluoride dentifrice or a 5000ppm fluoride dentifrice used twice daily was effective in preventing demineralization. Although 0.05% acidulated phosphofluoride mouth rinses (Phosflur, Colgate-Palmolive.Co) were prescribed for the examined Group I (Test group) subjects, it is surprising to observe the high rate of WSL prevalence that is evident in this study. The clinical significance of this study is two fold: This is the first ever in vivo WSL prevalence study done on an Indian population undergoing fixed orthodontic treatment. Secondly, inspite of adjunctive fluoride therapy in the form of fluoridated toothpaste/mouth rinses; the high prevalence of WSL in patients undergoing orthodontic treatment indicate the need to evaluate further methods to counter the risk of development of WSLs during orthodontic treatment. 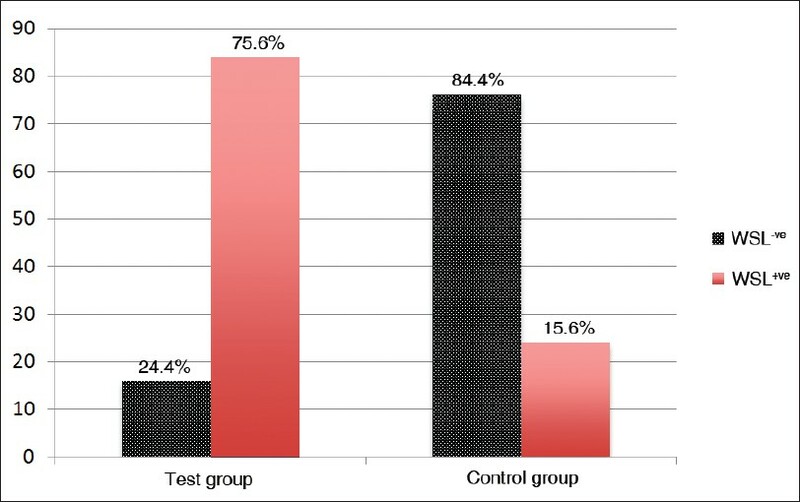 The results from the study show that high proportion of patients (75.6%) undergoing orthodontic treatment have at least one white spot lesion as compared to the control group of subjects (15.6%). Assuming the increased prevalence rate of five fold over the control group, this prevalence study recommends clinicians to give more importance to improve patient compliance in oral hygiene maintenance in the initial months of orthodontic treatment and subsequent extra preventive measures to prevent further demineralization. This study indicates that the current oral hygiene maintenance for orthodontic patients is ineffective in preventing WSLs during the course of treatment. Hence, further studies comparing various intervention and preventive strategies have to be assessed in order to reduce the burden of WSL disease during orthodontic treatment. 1. Gorelick L, Geiger AM, Gwinnett AJ. Incidence of white spot formation after bonding and banding. Am J Orthod 1982;81:93-8. 2. O'Reilly MM, Featherstone JD. Demineralization and remineralization around orthodontic appliances: An in vivo study. Am J Orthod Dentofacial Orthop 1987;92:33-40. 3. Mizrahi E. A cross sectional study to determine prevalence and severity of enamel opacities in patients before and after orthodontic treatment. Am J Orthod 1982;82:62-7. 4. Livas C, Kuijpers-Jagtman AM, Bronkhorst E, Derks A, Katsaros C. Quantification of white spot lesions around orthodontic brackets with image analysis. Angle Orthod 2008;78:585-90. 5. Mizrahi E. Surface distribution of enamel opacities following orthodontic treatment. Am J Orthod 1983;84:323-31. 6. Benson P. Evaluation of white spot lesions on teeth with orthodontic brackets. Semin Orthod 2008;14:200-8. 7. Zachrisson BU, Zachrisson S. Caries incidence and orthodontic treatment with fixed appliances. Scand J Dent Res 1971;79:183-92. 8. Boersma JG, Vander Veen MH, Lagerweij MD, Bokhout B. Caries prevalence measured with QLF after treatment with fixed orthodontic appliances: Influencing factors. Caries Res 2005;39:41-7. 9. Geiger AM, Gorelick L, Gwinnet AJ, Griswold PG. The effect of a fluoride program on white spot formation during orthodontic treatment. Am J Orthod Dentofacial Orthop 1988;93:29-37. 10. Tufekci E, Dixon JS, Gunsolley JC, Lindauer SJ. Prevalence of white spot lesions during orthodontic treatment with fixed appliances. Angle Orthod 2011;81:206-10. 11. Al Maaitah EF, Adeyemi AA, Higham SM, Pender N, Harrison JE. Factors affecting demineralisation during orthodontic treatment: A post-hoc analysis of RCT recruits. Am J Orthod Dentofacial Orthop 2011;139:181- 91. 12. Ismail AI. ICDAS Coordinating Committee. 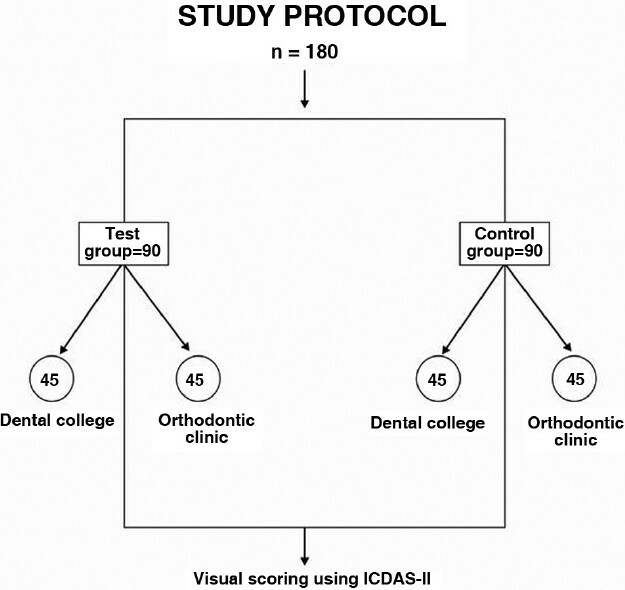 Rationale and evidence for the international Caries detection and Assessment System (ICDAS II). In: Stookey G, editor. Proceedings of the 7 th Indiana Conference, Indianapolis: Therametric Technologies, Indiana University Emerging Technologies Center; 2005. p. 161-222. 13. Bach EN. Incidence of caries during orthodontic treatment. Am J Orthod 1953;39:756-78. 14. Bach EN. Report of orthodontic children covering a period of twenty-five years. Am J Orthod 1954;40:83-108. 15. Zachrisson BU. Cause and prevention of injuries to teeth and supporting structures during orthodontic treatment. Am J Orthod 1976;69:285-300. 16. Ekstrand KR, Kuzmina I, Bjorndal L, Thylstrup A. Relationship between external and histologic features of progressive stages of caries in the occlusal fossa. Caries Res 1995;29:243-50. 17. Ekstrand KR, Ricketts DN, Kidd EA. Reproducibility and accuracy of three methods for assessment of demineralization depth on the occlusal surface an in vitro examination. Caries Res 1997;31:224-31. 18. Ismail AI. Visual and visuotactile detection of dental caries. J Dent Res 2004,83:C56. 19. Shivakumar K, Prasad S, Chandu G. International Caries Detection and Assessment System: A new paradigm in detection of dental caries. J Conserv Dent. 2009 Jan;12:10-6. 20. Carounanidy U, Sathyanarayanan R. Dental caries: A complete changeover, PART III: Changeover in the treatment decisions and treatments. J Conserv Dent. 2010 Oct;13:209-17. 21. Alexander SA, Ripa LW. Effects of self-applied topical fluoride preparations in orthodontic patients. Angle Orthod 2000;70:424-9.